Here are the blocks I worked on Friday night. I've finished 9 blocks of the 12 for my next 'Tis the Season Quilt. Didn't finish them all on Friday night -but this is my progress on the quilt. 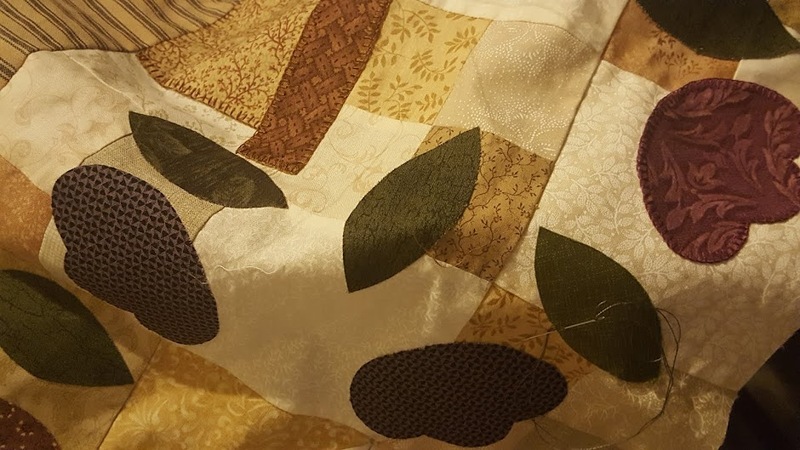 I worked a little further on the centre block for the Gardener's Journal Quilt. These are the finished blocks for 'Tis the Season. Have to work out border colours for them. These are my works in progress for the Gardener's Journal Quilt. This is the block I was working on Friday night - it's the centre block for The Gardener's Journal. This is a close up of the fabric from 'Tis the Season. It's from Homespun and Beautiful. I love the way it adds interest to the blocks. Oh my such gorgeous hand-stitching - those are wonderful! Tis the season is so pretty..I also worked on that a little while ago. Also like your gardening blocks. Beautiful work, I love the projects you have chosen. Thank you so much for playing along today. Beautiful stitching Marg! You have been very busy.